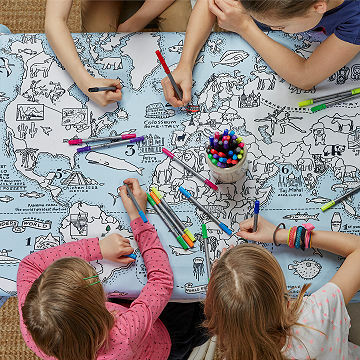 Learn geography and world facts by coloring the globe with this illustrated tablecloth. Maybe your little one hasn't been to Machu Picchu or the Taj Mahal yet, but they can get a peek at the wonders of the world next time they travel to the dinner table. This 100% cotton tablecloth is illustrated with hand-drawn countries, landmarks, and animals from around the globe. It even includes fun facts. (Did you know the first solo hot air balloon flight around the world wasn't until 2002?) Since it comes with ten washable markers, the whole family can color the map and experiment by adding drawings and designs while gathered around a meal. Wash it in warm water and the ink completely disappears, so your tiny traveler can create their own colorful art again and again. Made in India. Warm machine wash and air dry. It's a fun downtime activity for the entire family. I almost wish it wasn't "reusable" where the colors wash out in the washing machine. We won't be washing ours as I love how hard my son worked on it and he's really proud of it. This has been super fun for my kids during the winter holidays! My six year old Grandchild loved the tablecloth! Easy to use, fun and provides hours of entertainment. I bought this as a gift to my friends kid. She's 3 and very bright. I wanted to a way to introduce her to the world she lives in, but keep it fun. The map is a really fun way for her to become associated with the shape of the continents and oceans. This is a stroke of genius!